Rink Rover: "What's in a name? That which we call a goon by any other name would hit as hard." "What's in a name? That which we call a goon by any other name would hit as hard." The on-ice brawl between the Toronto Maple Leafs and Buffalo Sabres on Sunday lasted mere minutes, but the war over its significance rages on in debates about the role of fighting in hockey. Unlike other instances in which this divisive issue has become the central subject of debate among hockey writers, the current controversy has included arguments over the words that we use to describe fighters. James Mirtle of The Globe & Mail caused controversy with the words that he used in this article. People objected to his use of the words "goon" and "super goon" to describe players primarily known for (or unable to contribute to the game beyond) fighting their opponents. Normally I'd leave this situation alone because I don't think any amount of debate will change people who dislike hockey fights into fans of that aspect of the game. However, I decided to get into a debate with Mirtle on Twitter because he didn't understand why people might object to his use of the word "goon." I may be the only person to use the highly-favourable terms "champion" or "challenger"to describe fighters. I'm using an old form of "champion" that alludes to traditions of judicial combat. Sometimes armies would avoid bloodshed by agreeing to let the outcome of a battle be decided by a duel between each army's greatest warrior. Sometimes a person would fight to defend the honour of a person who (for whatever reason) could not do so herself or himself. A knight, for instance, might fight for a lady or for a king whose well-being couldn't be jeopardized by having him fight for himself. Pictured: Achilles fights Hector in single combat after the latter fatally high-sticked the former's friend, Patroclus (scene from Troy). In hockey, the "champion" or "challenger" often fights in place of an elite player who has been challenged or affronted by an opponent. For example, Colton Orr might fight for Phil Kessel if someone manhandled the Leafs' sniper. In other cases, this player would get into a fight in a losing game for the sole purpose of defending the team's reputation and, thereby, securing a moral victory in order to prevent the game from being an utter loss. To some it might be petty, but such attempts are a way to show that the team is too proud to go down without a fight. The term "policemen" captures the role fighters play when dormant: their mere presence on the bench can help to keep things civil and orderly between teams in a game. Like other terms in this list, this designation hinges upon a fighter's reputation rather than his actions. The fighter's presence deters misconduct by reminding players that there will be retribution for such actions. Should the threat of reprisal fail to keep players honest, the "policeman" becomes the "enforcer" who tries to redress any wrongdoing. The terms discussed so far generally uphold the notion that fighters make meaningful contributions to a game. Conversely, those who consider fighters as detrimental to the sport prefer "goon" or "face-puncher." The only term that both sides of this debate could agree upon if "fighter." This generic term is neutral because it captures the thing that unites each type of belligerent player--his fighting prowess. If Mirtle had intended his article to be neutral toward these players, he should have used "fighter" and similar words that describe someone who fights (e.g. combatant, pugilist) instead of "goon" and "super goon," which suggest that fighters are nothing more than paid thugs. Mirtle insists that "goon" and "enforcer" are interchangeable, non-derogatory terms. However, anyone familiar with "Little Bunny Foo Foo" would tell you that goons are awful things because being turned into one is a punishment reserved for creatures who are guilty of unprovoked, aggravated assault against field mice. I believe that the story of "Little Bunny Foo Foo" is taken from Ezekiel 25:17. 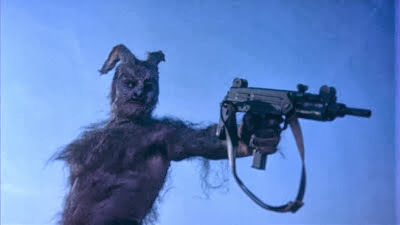 "The path of the righteous bunny is beset on all sides by the inequities of the selfish and the tyranny of evil goons. Blessed is he who, in the name of charity and good will, shepherds the weak through the valley of darkness, for he is truly his brother's keeper and not the bopper of lost rodents. And I will strike down upon thee with great vengeance and furious anger those who attempt to poison and destroy my field mice. And you will know my name is the Lord when I lay my vengeance upon thee." Mirtle's argument that "goon" and "enforcer" are interchangeable seems based on understanding "synonym" to mean "same-o-nym." Synonyms designate words that are comparable or have similar yet (in at least some ways) markedly different meanings. Thus "goon" is a synonym for "enforcer" in that both words describe the same object, which is, in the context of hockey, a person renowned for his fighting prowess. The fact that the words are synonymous doesn't change the fact that each contains connotations that express certain attitudes toward players whose game revolves around fighting and the role of fighting in the game. I list "face-puncher" lower than goon because this word suggests that fighters are bereft of even the meager intelligence possessed by goons. Below "face-puncher" are whatever other words people devise to disparage fighters. One such example is "coke machine." These terms, of course, can apply to any one fighter based on circumstance. A player's actions in a game, his purpose on the team, and his reputation all contribute to what words suit him as a fighter in a game or in general. Frazer McLaren, for example, might serve as a policeman in one game, enforce civility in another, and act like a goon in another game. These terms are similar to designations such as "knight," "raider," and "mercenary." A knight can be employed for mercenary reasons or go on a raid. Both a raider and a mercenary can act chivalrous. Often these terms describe the actions of different warriors or the opinions of others toward them. Another way to consider this situation would be to use pizza as an analogue. Hawaiian, Canadian, and Greek are all types of pizzas that some people like and others hate. Despite key differences among them, each type shares qualities with the others that make it belong to a general kind of food. In a similar manner, the basic function of a player as a fighter unites him with others despite differences in their actions or reputations as fighters. Reputation perhaps has the greatest influence over how a fighter is perceived because fans often form prejudices toward players. For instance, John Scott could single-fistedly thwart an alien attack of Independence Day proportions, and a large contingent of Leafs fans would still consider him to be nothing more than a goon. Colton Orr could save Nazem Kadri from the clutches of a rabid Zdeno Chara, but Orr's detractors would still blame him and players of his ilk for the role violence plays in hockey. Personally, I hope that classifying fighters will help us to understand and appreciate the contributions that these players make to the game. If nothing else, these terms should enable us to discuss the function of hockey fighters with greater precision. These definitions aren't perfect, and they will all need further elaboration and revision. But, at the very least, they clarify that many of the words used to discuss hockey fighters reflect attitudes toward them and the role that they play in the game. Given how disagreements over these subjects have generated so many articles, blogs, and tweets, it's not surprising that language is another battlefield in this conflict over old-time hockey!